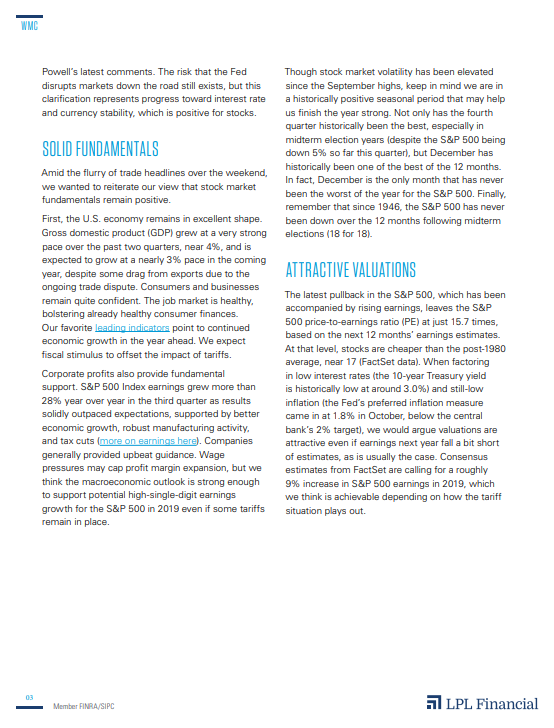 Small Caps On Sale: Seasonal Bounce Ahead? There has been a good deal of rhetoric lately as to how small caps have underperformed badly recently. On closer examination however small caps have actually performed right in line with historical seasonal patterns (yes, the magnitude of the moves have been greater) and they appear poised for their usual seasonal breakout which tends to begin in late-November, but does not fully get underway until mid-December. 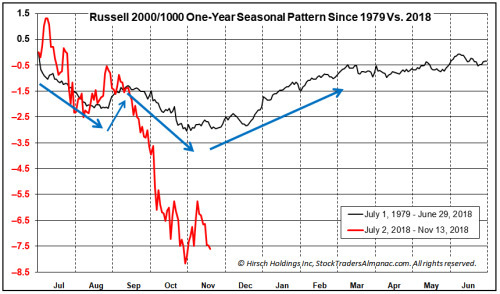 The chart below taken from page 110 of the Stock Trader’s Almanac 2018 shows the one-year seasonal pattern of the ratio of the Russell 2000 to the Russell 1000 from July through June to highlight the perennial low point of this relationship, November and the winter rally mentioned above. We have added the performance of this ratio in 2018 so far through today’s close and updated the historical average pattern through June 30, 2018. While this year’s pattern has more amplitude, the trend is quite similar to the historical pattern. 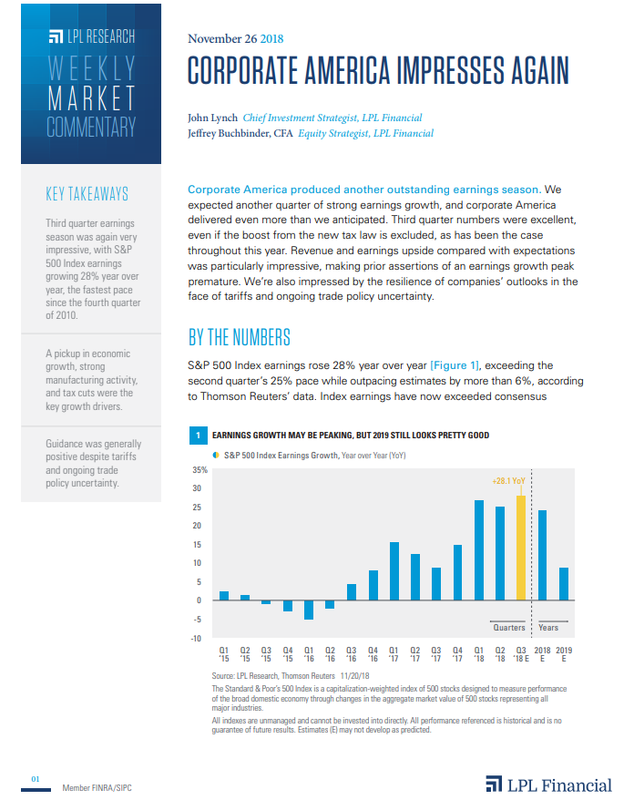 Small caps underperformed from late June through mid-August, then had the usual pre Labor Day rally, followed by a customarily weak October. It now appears that small caps could be setting up nicely for their season of outperformance. 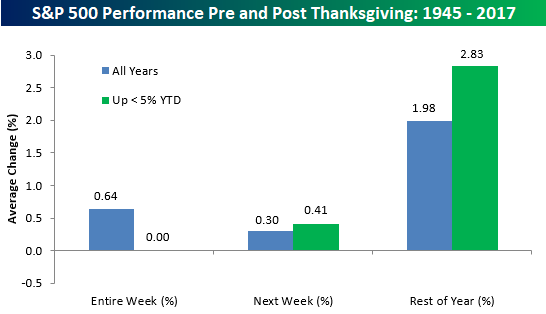 Trading around Thanksgiving has a bullish tendency perhaps buoyed by the “holiday spirit.” First published in the 1987 Stock Trader’s Almanac, the Wednesday before and the Friday after Thanksgiving combined were up 34 times in 35 years. The only S&P 500 decline was in 1964. Subsequently, this trend changed. In the 31 years since 1987, there have been 8 declines and 22 advances. 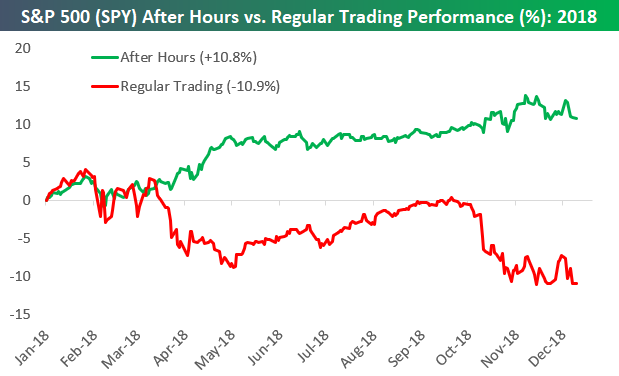 The best short-term trade appears to be getting long into weakness on Monday or Tuesday of Thanksgiving week and selling into any subsequent rally by the end of Thanksgiving week, but remain nimble as events like Greece’s debt crisis in 2011 can cancel Thanksgiving on Wall Street. Also of note is the change in the yearend rally. Prior to 1987, from the close of trading on the Friday after Thanksgiving to yearend, the S&P 500 rallied only 20 times in 35 years. As Thanksgiving bullishness lost steam in 1987, the rally afterwards occurred more frequently. Since 1987, S&P 500 has logged gains in 24 of 31 years from the close on Friday after Thanksgiving to yearend. 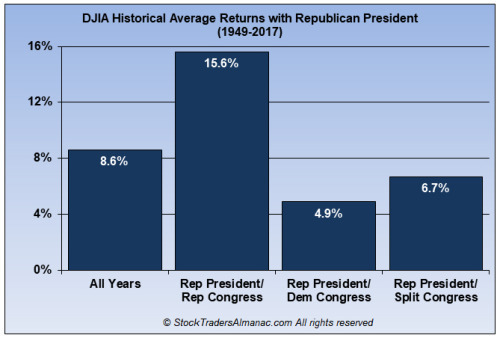 Over the same time period, the worst combination for DJIA performance was a Republican President and full Democratic control of Congress with an annual average gain of just 4.9%. Under a Republican President and a split Congress, DJIA has averaged gains of 6.7%. This is neither the best nor the worst historically. 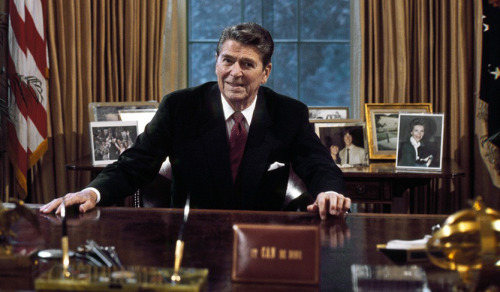 Last time we had a Republican President with a Split Congress consisting of a Democratic House and a Republican Senate was during Ronald “The Great Communicator” Reagan’s first six years in office. 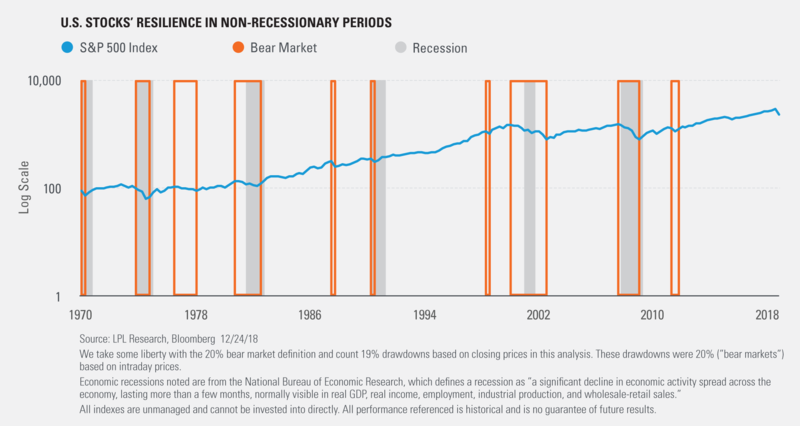 To start off his term the market topped on April 27, 1981 for DJIA (11/28/1980 for S&P and 5/29/1981 for NASDAQ), which culminated in the bear market bottom on August 12, 1982 (Aug 13 for NAS). However, these were some of the most productive years for the federal government as The Great Communicator had a worthy adversary, or partner really, in veteran statesman and sitting Speaker of the House, Tip O’Neill. Reagan and O’Neill worked diligently together compromising and passing legislation and instituting policy that would shape and fuel the information revolution and the last secular bull market and Super Boom. In those six years from 1981 to 1986 DJIA averaged 12.9% annually. Similarly, when Bill Clinton lost Congress in his first midterm election in 1994, the market and economy resumed the Boom in 1995 as new Republican Speaker Newt Gingrich and Clinton worked together despite their many differences of opinion and ideology. There is hope for the next two years if the Democratic Speaker and President Trump decide to put the country ahead of politics and rhetoric. Hold on a second. 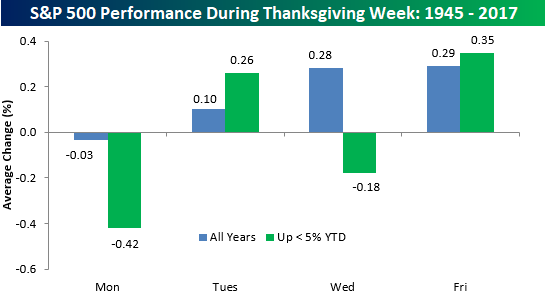 Yes, this was the worst Thanksgiving week for the S&P 500 since 2011 and the 5th worst since 1930. But this does not mean the bull market is over for stocks and there is no upside. 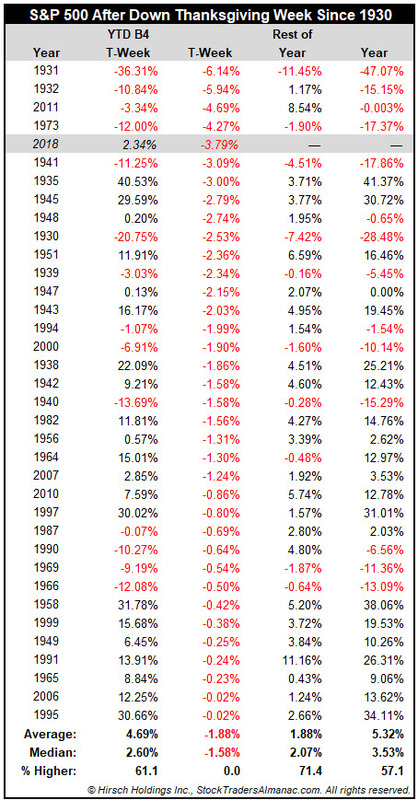 Just look at the table below of the S&P 500’s performance following all down Thanksgiving weeks since 1930. Sure the market was horrible back in the 1930s at the depth of the Depression, but 1933 was up 46.6% following down T-Week in 1932. 2011 was a great entry point and the following year 2012 was solid up 13.4%. More down T-week years ended in the black and 71.4% had solid gains to finish the year. 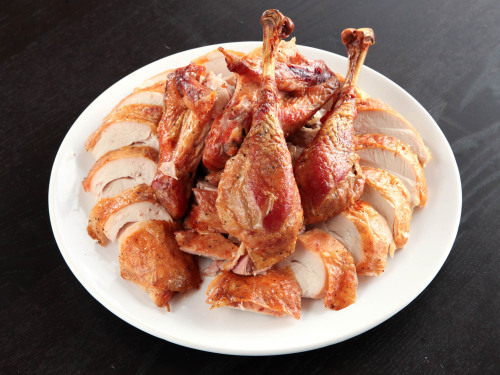 So don’t let the market’s turkey hangover get you down. 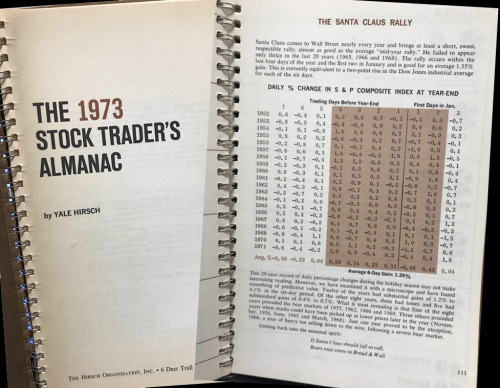 This never gets old and it’s a testament to the brilliance and iconic thinking of Yale Hirsch, my illustrious father and founder of the Stock Trader’s Almanac. Everyone on Wall Street is either officially on the Santa Claus Rally bandwagon or vehemently against it. Either way, as soon as Thanksgiving comes around on the calendar – or even Halloween – all the talk on The Street is: “Will we or won’t we have a Santa Claus Rally?” But they all refer to it as the 4th Quarter Rally or the November-December Rally or the December Rally or the Halloween-New Year’s Rally or the Thanksgiving-Christmas Rally. At least Wikipedia and Investopedia have it right. I am thankful for Yale and the Almanac.He just turned 95 and lives nearby with mother. 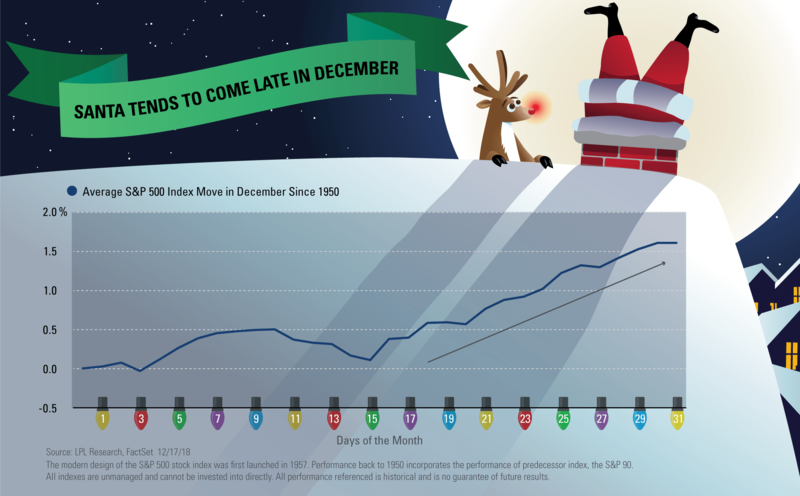 December is the number one S&P 500 month and the second best month on the Dow Jones Industrials since 1950, averaging gains of 1.6% and 1.7% respectively. It’s also the top Russell 2000 (1979) month and second best for NASDAQ (1971) and Russell 1000. 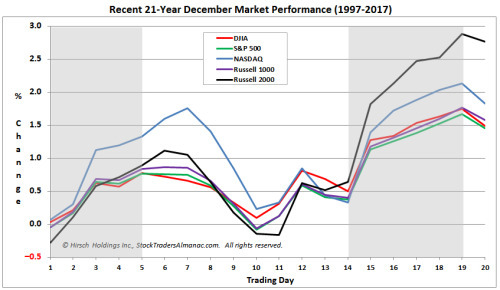 Rarely does the market fall precipitously in December. When it does it is usually a turning point in the market—near a top or bottom. 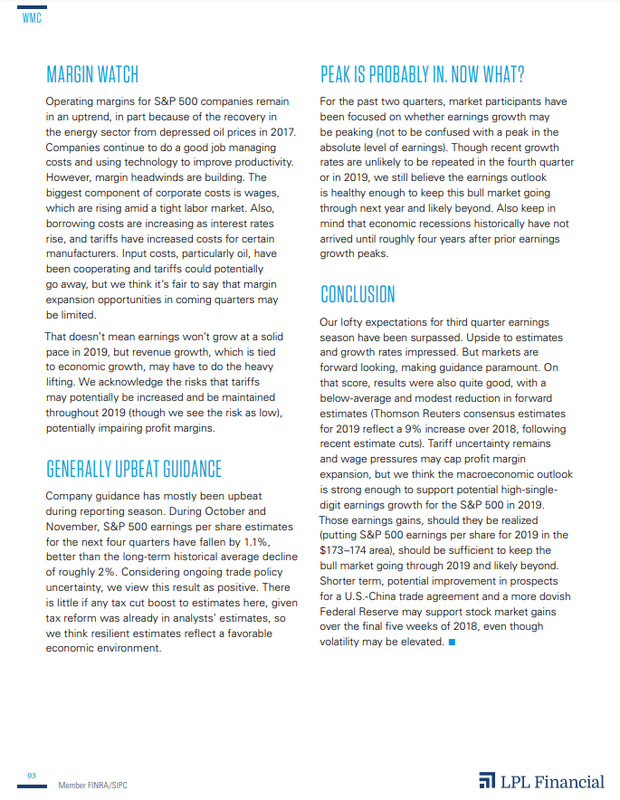 If the market has experienced fantastic gains leading up to December, stocks can pullback. 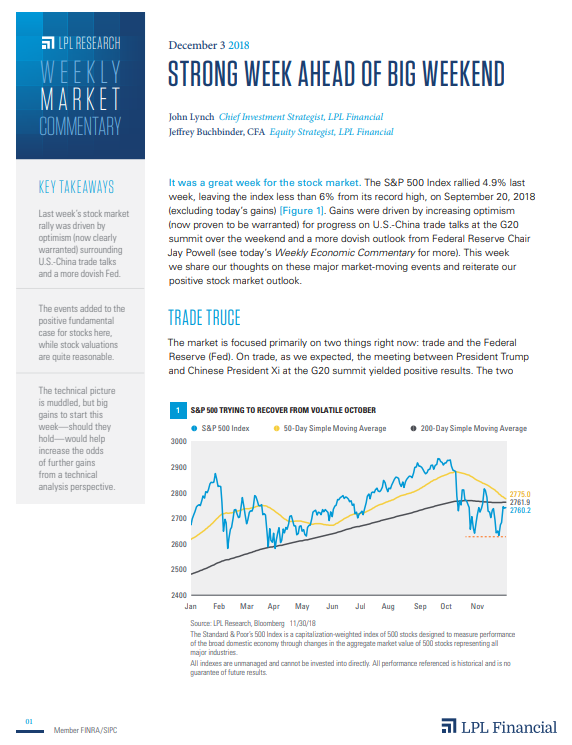 Small caps tend to start to outperform larger caps near the middle of the month (early January Effect) and our “Free Lunch” strategy is served from the offerings of stocks making new 52-week lows on Triple-Witching Friday. An Almanac Investor Alert will be sent prior to the open on December 24 containing “Free Lunch” stock selections. The “Santa Claus Rally” begins on the open on Christmas Eve day and lasts until the second trading day of 2019. Average S&P 500 gains over this seven trading-day range since 1969 are a respectable 1.3%. In the last seventeen midterm years, December’s rankings slip modestly to #3 S&P 500 (1.8%) and DJIA (1.5%) and #5 NASDAQ (0.6% since 1974). Small caps, measured by the Russell 2000, also perform well in midterm Decembers. Since 1982, the Russell 2000 has lost ground just twice in nine midterm years in December. The average small cap gain in all nine years is 0.7%. In 2010, Russell 2000 gained 7.8% in December. 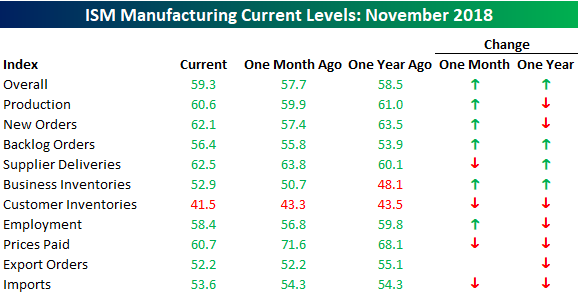 Today’s release of the ISM Manufacturing report for November broke a string of back to back declines in the index and easily surpassed expectations. 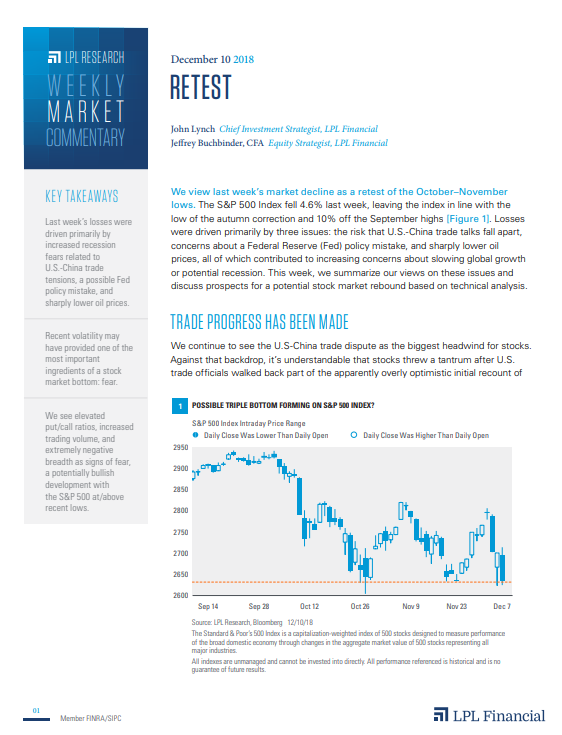 While economists were forecasting the headline index to come in at a level of 57.5, the actual reading came in at 59.3. 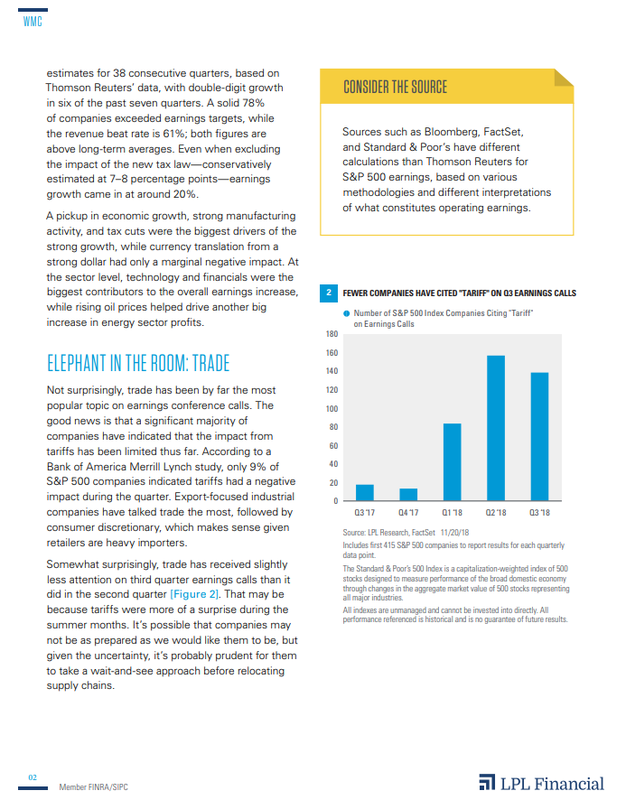 Breadth in this month’s report was pretty much split right down the middle as five categories showed increases, four declined, and one was unchanged. On a y/y basis, it was less positive. Although the headline index is higher than it was at this time last year, seven out of ten components are down. The biggest decliner on a m/m and y/y basis was Prices Paid. In November, Prices Paid declined from 71.6 down to 60.7, which was the largest m/m decline since June 2012. For those worried about rising inflation, this month’s decline provides some comfort. 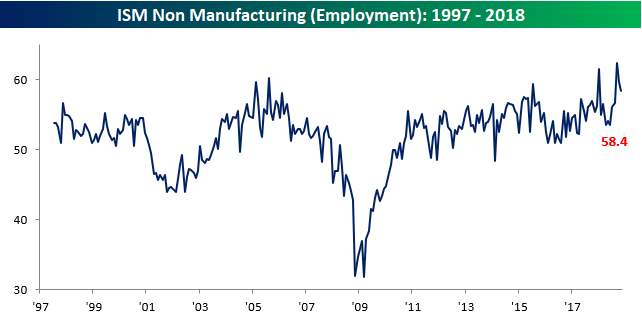 Finally, with the November jobs report coming up Friday, we wanted to note that the employment component of this month’s report increased from 56.8 up to 58.4, indicating another healthy jobs reading for the manufacturing sector at least. 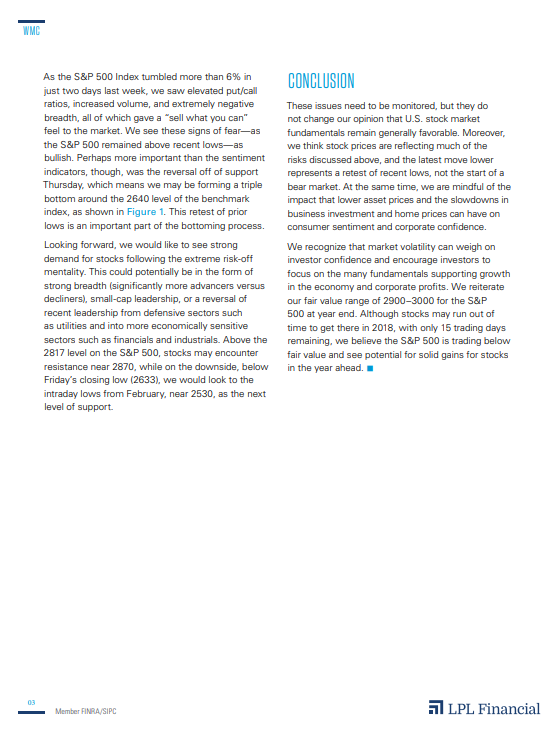 We’ll be paying closer attention, however, to the ISM Services report which will be released on Thursday morning. The Services sector makes up roughly 80% of the US economy compared to just 20% for the manufacturing sector. Historically, the second trading day of December, today, has been a modestly bullish day with S&P 500 advancing 36 times over the last 68 years (since 1950) with an average gain of 0.13%. To find a worse second trading day of December, you would have to go all the way back to 1932 when S&P 500 dropped 3.86%. 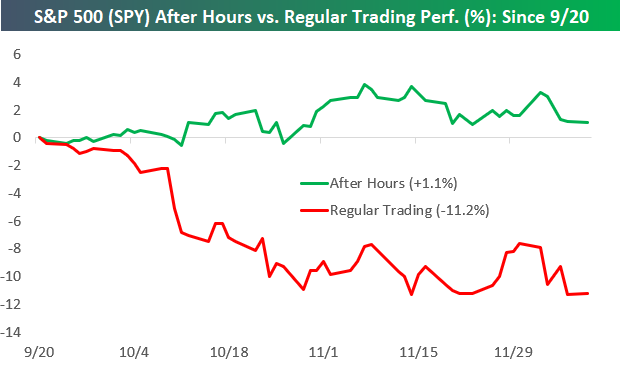 Trade remains a concern, but today’s sell off appears to have been triggered by economic growth fears caused by a flattening Treasury yield curve and 5-year yields dipping below 2-year yields. As we have repeatedly noted, the Fed is the biggest risk to the market and the economy. 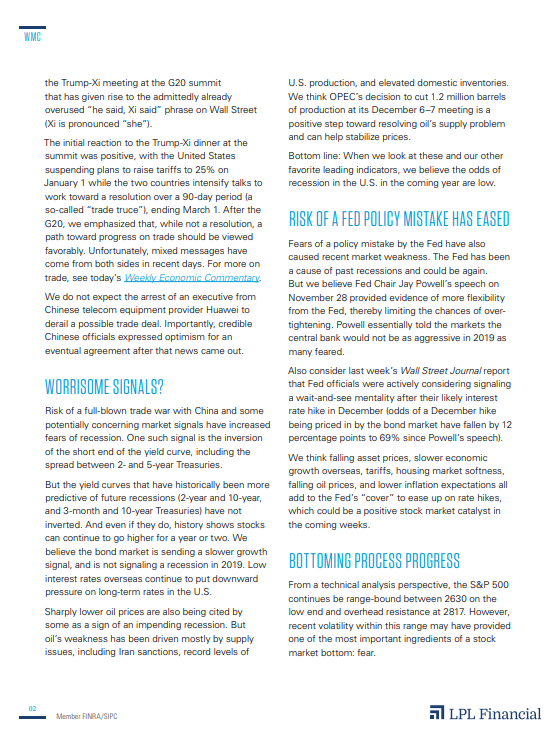 These fears could lead to a larger than usual amount of choppy trading during the first half of December. 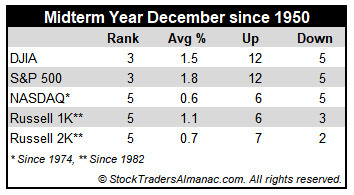 Historically December has opened with strength and gains over its first five trading days before beginning to drift. 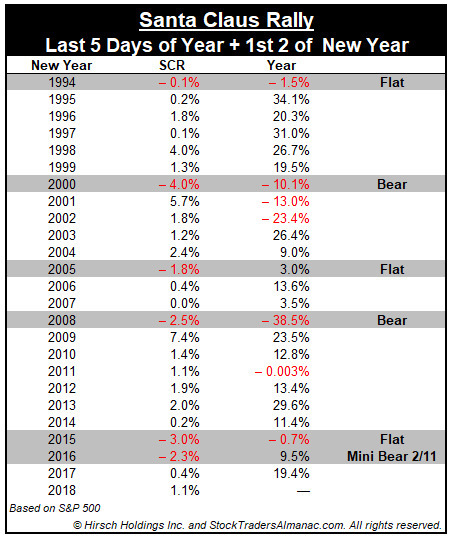 By mid-month all five indices have surrendered any early-month gains, but shortly thereafter Santa usually visits sending the market higher until the last day of the month and the year. 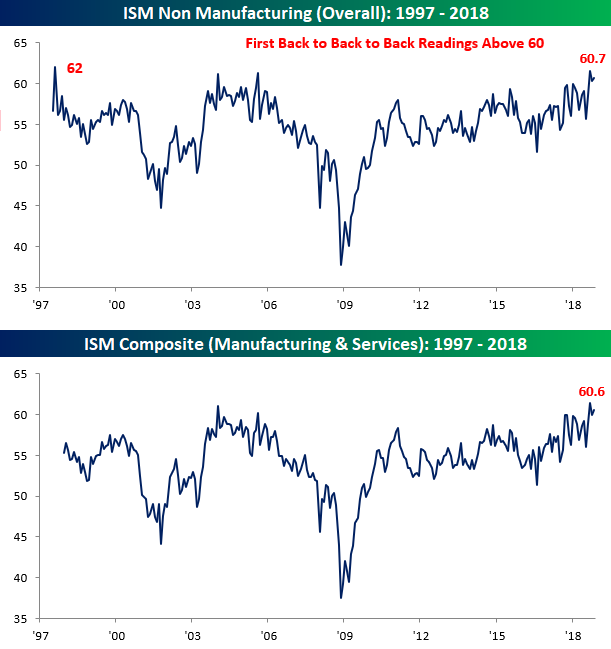 The ISM Non-Manufacturing report for the month of November showed that the services sector of the economy (the lion’s share) continues to hum along. While economists were expecting the headline index to come in at a level of 59.0, the actual reading stayed above 60, hitting a level of 60.7. What’s notable about this is that even though it is still off its highs from two months ago, the current string of back to back to back readings above 60 is the longest streak of 60+ readings since the survey began in 1997! 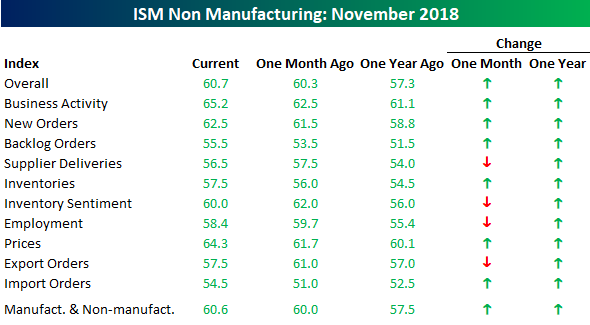 On a combined basis and accounting for each sector’s share in the overall economy, the combined ISM for the month of November was 60.6, which is also among the highest readings on record. 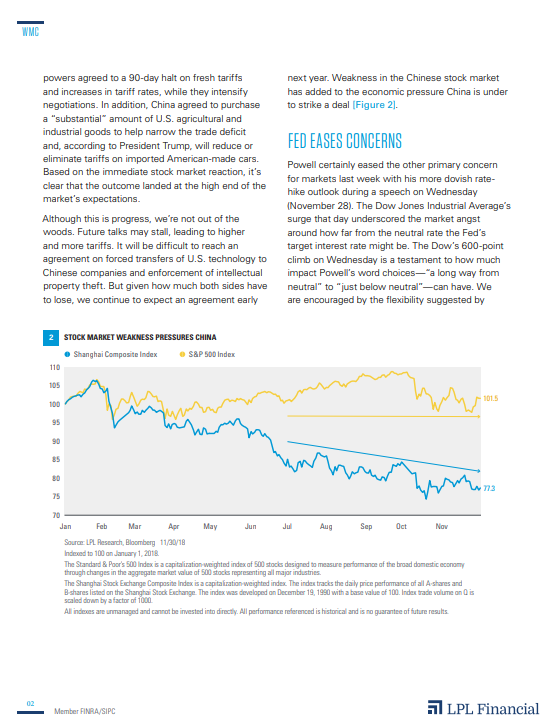 Breadth in this month’s report was somewhat mixed. Of the index’s ten sub-components, six were up in November and four were down, but all of them are still well above 50 – the threshold for growth. The key gainer on the month was Business Activity (top chart below table), which is back at its highest levels of the cycle, while one of the bigger disappointments to the downside was Employment, which has seen a bit of a reversal from its recent surge higher in the prior few months (lower chart). Below is a quick market stat to log as 2018 nears an end and 2019 approaches. In the chart, we show the S&P 500’s average price change in years ending in 0 through 9. This data goes back to 1928 when the S&P 500 begins. 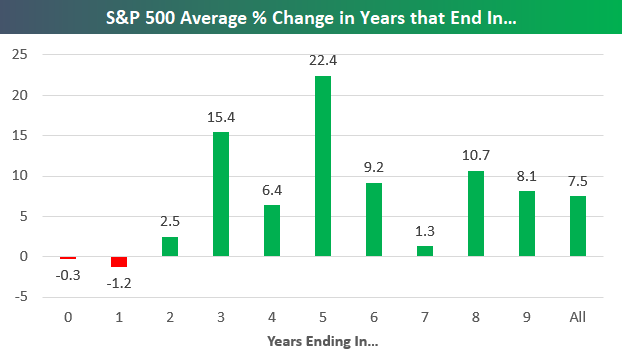 As shown, years ending in “8” have historically seen the S&P 500 gain an average of 10.7%. At one point earlier in 2018, this type of gain seemed likely, but not anymore now that the S&P is down 2% YTD. Years ending in “9” have historically seen an average gain of 8.1%, which is just a hair above the average of 7.5% seen for all years since 1928. The best years have come in years ending in “5” with an average gain of 22.4%. Years ending in “3” rank second with a gain of 15.4%. On the negative side, years ending in “0” and “1” have both averaged losses throughout history. Below we show the consistency of positive returns for the S&P 500 in years ending in “0” through “9”. 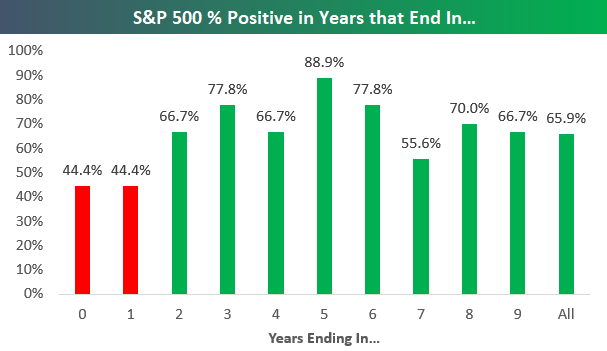 As shown, years ending in “5” have been positive 88.9% of the time (8 out of 9), while years ending in “0” and “1” have been positive just 44.4% of the time (4 out of 9). What exactly does a shutdown mean for stocks? 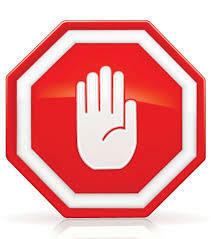 “Although shutdowns get a lot of media hype, the reality is that stocks tend to take them in stride. 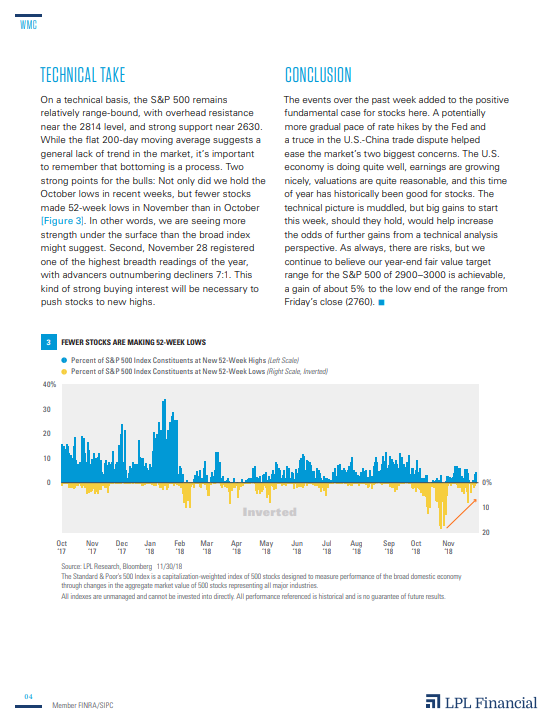 In fact, the S&P 500 has gained during each of the five previous shutdowns,” explained LPL Senior Market Strategist Ryan Detrick. 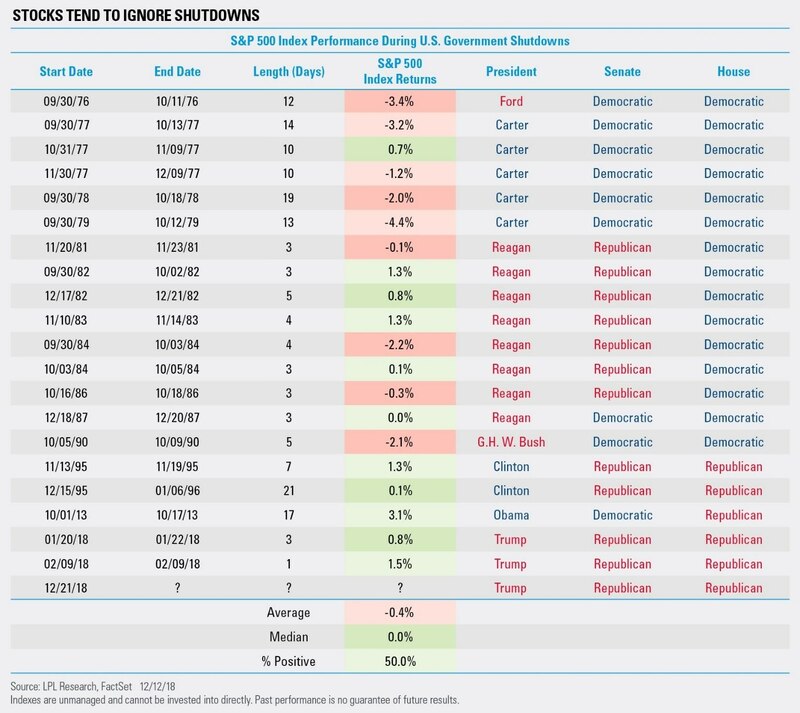 As our LPL Chart of the Day shows, shutdowns rarely push stocks significantly lower and have corresponded with a flat median return in the previous 20 shutdowns going back more than 40 years. One would think shutdowns in December might be rare, but they’re actually fairly common. Three shutdowns in the same year, however, is not. Could this year be the first since 1977 with three separate shutdowns? If yesterday’s drama was any indication, the odds may have increased. However, next summer’s debt ceiling debate will be a more important issue when Treasury interest payments are at risk. What could spark a Santa rally? It very well could be today’s Federal Reserve Bank (Fed) decision on interest rates.